Heat grill. Drizzle both sides of tuna steaks with oil; rub with garlic. Let stand at room temperature for 15 minutes to marinate. Meanwhile, arrange tomato slices around outside edge of large serving plate or platter. Arrange cheese slices inside ring of tomatoes, overlapping tomatoes slightly. Drizzle with vinaigrette; sprinkle with basil. Set aside. When ready to grill, place tuna on gas grill over medium heat or on charcoal grill 4 to 6 inches from medium coals. Cook 8 to 10 minutes or until fish flakes easily with fork. Do not turn tuna. Flake fish into chunks; arrange in center of tomatoes and cheese on platter. 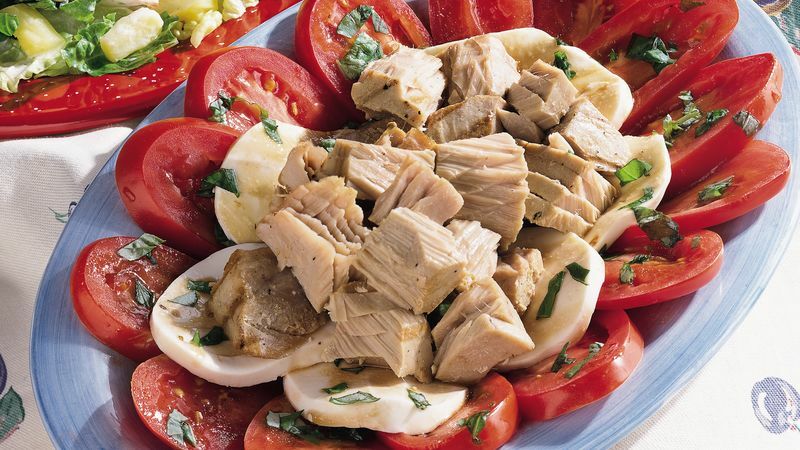 To broil tuna, place on broiler pan; broil 4 to 6 inches from heat using times above as a guide. Italian plum tomatoes are oval, pear-shaped tomatoes. Sliced lengthwise, plum tomatoes have a unique shape, which adds interest to a salad. Fresh mozzarella cheese is shaped into balls and kept in water or whey. Often made from whole milk, fresh mozzarella has a soft, creamy texture and a mild, sweet flavor. One tablespoon each of olive oil and balsamic vinegar can be used in place of the balsamic vinaigrette in this salad. Whisk together the oil and vinegar and add a small amount of crushed garlic. Standard vinaigrette dressing may also be used in this salad, but the flavor will not be as full as if balsamic vinaigrette is used.